The mortgage documentation mess that came to light on October 14 triggered an automated sell-off of the common and preferred stock shares offered by large mortgage lenders and servicers. Selecting out the highest quality issues identifies 26 specific preferred stocks issued by six different companies that are now available to preferred stock buyers for a discounted price (see Table 1). Automated selling kicked in on October 14 and has dropped the current market prices of these 26 high-quality preferred stocks by an average of $0.44 per share over the last two weeks. Any title company employee will tell you that very few mortgage borrowers actually read the massive stack of paperwork that they are required to sign when buying a home. The requirement for the vast majority of these forms stems from some long-forgotten lawsuit rather than anything resembling good business reasons. If you haven't purchased a home lately, these document packages can easily exceed the page count of a James Rollins novel and, in the event of a foreclosure package, you are looking at over 300 pages of forms. There are forms that ask you to agree to terms as specified in a specific law or government regulation, which is never attached since that would just complicate matters further. There are even forms that ask you to agree that you have received other forms. And you sign forms saying that you are authorized to sign more forms. The typical sign-off session can take hours. First-time borrowers getting a Federal Housing Administration (FHA) loan are advised to bring a toothbrush. Borrowers, who are generally ill-equipped to challenge the terms expressed in such documents, are faced with (a) signing without reading or fully understanding or (b) walking away from the deal - and their new home. The fact is, and has been for a long time, that borrowers, overwhelmed at the hundreds of pages in front of them and in a hurry to get their impatient kids home to dinner, usually just sign (and sign and sign and sign...). The mortgage document mess that erupted during October shows us how absurd buying a home has gotten; it is literally now the case, officially, that the documentation has grown so obscure and confusing that neither party to the agreement, borrower and, as we now know, lender, actually read it. So when barrower's lawyers expressed shock and dismay in court last month at statements from lender employees attesting that they had not actually studied some of the forms found within these document packages before signing them, it sounded a bit disingenuous since their clients, the borrowers, rarely read them either. When the mortgage documentation pot boiled over on October 14 and it started to become apparent that mortgage lenders and servicers were going to have to undertake a tedious, labor-intensive and costly exercise to review and update hundreds of thousands of foreclosure forms, investors quickly understood that profits, at least in the short-term, were going to take a hit. This is where it is important to understand the difference between the payment of quarterly common stock dividends and the payment of quarterly preferred stock dividends. A company's quarterly common stock dividends are very closely linked to its quarterly profits; preferred stock dividends, on the other hand, are more closely linked to the company's cash flow. This is especially true of "cumulative" preferred stocks where, in the event of a missed dividend payment, the company still owes you the money. The cash needed to pay a quarter's cumulative preferred stock dividend is known and reserved in advance and it does the company little good to skip paying you since doing so does not change their obligation to pay. This is very different from the considerations that go into paying, or not, the quarterly common stock dividend. Common stock dividends do not come with any type of cumulative obligation to pay so are much more a function of each quarter's profits. Undeterred by such differences, automated trading systems kicked in and started selling on October 14. Bank of America (the proud owner of what use to be Countrywide), for instance, saw the market price of their common stock drop by over 10% in the 48 hours ending October 15 (and is still down). These automated systems do not seem to make much of a distinction between a company's common stock and the same company's preferred stock when it comes to selling off and that is where the opportunity is for preferred stock investors. Over the same 48 hour period that saw the market prices of large mortgage lenders/servicers fall, the volume of preferred stock shares traded over this short period tripled as computer programs blindly disregarded the difference between the considerations that go into paying common stock dividends versus preferred stock dividends; they appeared to be applying common stock risk algorithms to preferred stock share holdings. 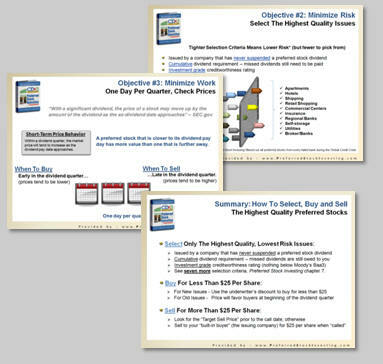 While the havoc brought on by this latest mess will reach many companies, applying the ten preferred stock selection criteria from chapter 7 of my book, Preferred Stock Investing, allows us to identify the highest quality preferred stocks ("CDx3 Preferred Stocks," see sidebar at the top of this CDx3 Newsletter for criteria examples) issued by mortgage lenders and servicers. As itemized in Table 1, 26 specific preferred stocks were able to pass the filter (note that to protect the values of subscriptions to the CDx3 Notification Service, my preferred stock email alert and research newsletter service, the trading symbols used here are fictitious. Subscribers can find the trading symbols posted on the CDx3 Discussion Group). All 26 of the preferred stocks listed in Table 1 are cumulative and all are rated investment grade by Moody's. And yet the automated selling that took place in response to the mortgage documentation mess has caused the market prices of these high-quality preferreds to drop an average of $0.44 per share since October 13, creating a unique opportunity for preferred stock buyers. There are even nine issues to pick from that are currently available for a market price less than the redemption price of $25.00 per share (see bold typeface November 2 prices). Table 1 is sorted by the last column, Change. 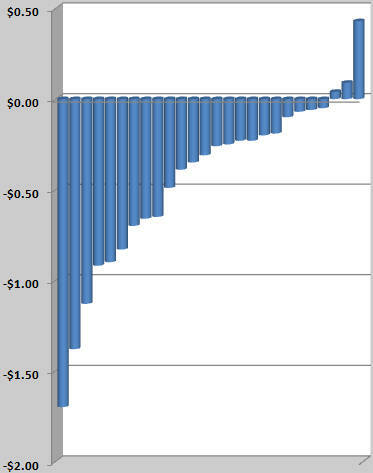 The Change column shows the drop in market price per share since October 13 for each of these preferred stocks. Only three of these high-quality preferred stocks have avoided a price drop. Using November 2, 2010 closing prices, the average annual dividend yield of the 26 issues identified here is 7.391% (have you seen the interest rates being paid by bank CDs lately?). This chart graphically illustrates the opportunity. The 26 preferred stocks identified in Table 1 are issued by six different companies. The automated sell-off over the last couple of weeks has been focused on some companies more than others, but all have seen the market price of at least one of their high-quality preferreds drop in price. In many cases, the discounted market prices that are now available to buyers have not been seen since last July. If you thought that you missed the opportunity then, you have been given a rare second chance - courtesy of a package of documents the signers of which no longer read. PS Business Parks is a $1.4 billion Real Estate Investment Trust (REIT) that engages in the acquisition, development, ownership, and operation of commercial properties primarily multi-tenant flex, office, and industrial space. PSB, headquartered in Glendale, California, was founded in 1983 as a spinoff of Public Storage. Public Storage still owns about 25% of PSB's common stock and the two companies share a CEO in Ron Havner. As of July 2010 PSB owned and operated approximately 21.1 million rentable square feet of commercial space located in eight states: Arizona, California, Florida, Maryland, Oregon, Texas, Virginia, and Washington. This space enjoyed a weighted average occupancy rate of 90.4% throughout 2009 (source: PSB 2009 Annual Report). Much of this space is "flex" space. Flex space refers to a building that is specifically designed and built so that its interior can be reconfigured to meet varying tenant needs over time. PSB locates its properties in high population growth markets near what the company refers to as "decision maker housing." PSB follows an age-old management practice: "cash is king." While many of their REIT competitors took on massive amounts of debt during the real estate boom, PSB largely sidestepped that pitfall. From its 2009 Annual Report, CEO Havner says "...since we believe the economic environment will continue to be challenging and capital for privately owned commercial real estate will remain scarce, we are patiently waiting for opportunities. With $230 million in cash and an unused $100 million line of credit, we are positioned to take advantage of acquisition opportunities as they arise." PSB avoided the commercial mortgage backed securities (CMBS) debt that many of its competitors took on by the truck load. The volume of CMBS debt held by REITs that is coming due over the next five years exceeds $1 trillion. With delinquencies already starting to pick up, Havner sees opportunity for cash-rich PSB. Havner knew then that, beginning in 2010, many of his competitors would have to start selling off properties at bargain basement prices in order to generate the cash needed to pay off maturing debt. With prices way down and debt-laden competitors anxious to lighten the load, acquisition opportunities have started to present themselves for PSB, right on queue. Tycon II and Tycon III, a 270,000 square foot two-building multi-tenant office park located in Tysons Corner, Virginia, for an aggregate cost of $161.7 million. The successful expansion of PSB's presence in Virginia is particularly important as this market has been particularly profitable for the company. Looking at the table, PSB's Virginia space represents 15.5% of the company's property holdings (in leasable square feet), but contributes 22.3% to PSB's Net Operating Income (NOI). Learn more about PS Business Parks: Company website | Profile | Upgrades/Downgrades | Recent News. 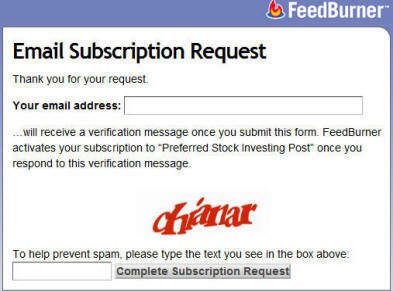 How do I pick the highest quality preferred stocks? Answering this question, along with gathering the data needed to do so, consumed over a year of research and now occupies chapters 7 and 15 of my book, Preferred Stock Investing. To a certain extent, the answer depends on how we define the phrase "highest quality." What may be high quality to one investor may send another investor running for cover. For most investors though, the quality of an investment is directly related to its return versus its risk. Most investors would agree that an investment that provides an above-average return with below-average risk is of higher quality than an investment providing the opposite - lower return for higher risk. Most investors would also agree that an investment that provides no return could be considered to be of low quality. This is where history can help us put boundaries on this question since we can identify such securities by looking at historical data (back to 1926 in my case). When looking back at the characteristics of preferred stocks that have had their dividends suspended, patterns and consistencies start to emerge. That is, many of these failed securities have had common characteristics. Similarities also emerge among preferreds that have provided investors with reliable returns without a hiccup since their introduction, despite some historically rocky economic conditions. The highest quality issues are going to be among the ones that share the characteristics of those issues that have consistently paid their dividends without fail. The question this month for preferred stock investors: How do I pick the highest quality preferred stocks? (A) The prospectus specifies that the dividends are "cumulative." 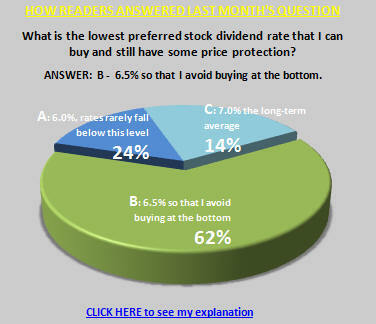 (B) The preferred has a current "investment grade" rating. (C) The issuing company has a perfect track record of never suspending a preferred dividend. The correct answer to this question is (D), all of the above. Notice that neither these criteria, nor any of the remaining CDx3 Selection Criteria from chapter 7 of Preferred Stock Investing, have anything to do with specific industries or types of businesses. We are looking for the highest quality issues regardless of where they come from. So while relaxing these criteria may provide an investor with a different array of industries from which to choose, doing so increases investor risk. For example, for preferred stocks from telecommunications or manufacturing to become candidates, you would have to give up the "cumulative" dividend requirement. While there are a few exceptions, preferred stocks issued by companies in these industries are generally "non-cumulative," meaning that if the issuing company misses a dividend payment to you they have no obligation to make it up in the future. Risk adverse preferred stock investors are looking for preferred stocks that are "cumulative." Rating agencies such as Moody's and Standard & Poor's provide creditworthiness ratings for preferred stocks. These ratings have two main categories, investment grade and speculative grade. Preferred stocks that carry the investment grade rating are viewed by the rating agency as being of lower risk than those rated speculative. While the dividend return of a speculative grade preferred stock may be higher than those rated investment grade, the CDx3 Selection Criteria favors lower risk over higher returns. And looking for preferred stocks that are issued by companies with a solid history of consistent performance is also important when trying to identify the highest quality preferreds. Airlines provide an obvious example. If you had to choose between two preferred stocks, both cumulative and investment grade but one had been issued by a company with a history of bankruptcy and suspended dividends (e.g. Delta Airlines) and the other had not, which would you judge to be the higher quality security? Having cumulative dividends, an investment grade rating and being issued by a company with a perfect track record of never having suspended preferred stock dividends are just three of the ten CDx3 Selection Criteria from chapter 7 of Preferred Stock Investing. With new issues being introduce, and old issues being retired, the number of preferred stocks trading every day ranges between 1,000 and 2,000. By applying the ten CDx3 Selection Criteria, preferred stock investors are left with the highest quality issues available. The resulting list is available 24/7 to subscribers to the CDx3 Notification Service in the CDx3 Preferred Stock Catalog on the subscriber's exclusive website. The October issue of the CDx3 Newsletter described the three-month process undertaken by Standard and Poor's, due to wrap up in November, to rebalance its S&P U.S. Preferred Stock Index. S&P's rebalancing includes the addition of about 200 preferred stocks to their Index that were not previously included. This rebalancing, in turn, has caused iShares to commensurately restructure their Preferred Stock Exchange Traded Fund (PFF | quote), mostly by selling millions of shares of previously included preferred stocks and buying smaller quantities of the 200 new entries. Ending in November, this restructuring has create short-term downward pressure on the market prices of many preferred stocks. And now, simultaneously, we have the mortgage documentation mess. As described in the above "Last Month's CDx3 Investor Results" article, this latest fiasco is putting additional short-term downward pressure on the market price of several preferred stocks as well. The S&P U.S. Preferred Stock Index rebalancing and the mortgage documentation mess, occurring simultaneously purely by chance, have combined to produce some really great, albeit short-lived, prices that should interest preferred stock buyers. While we do not know how long these effects will last, it is clear that, at least for the time being, the month of November should provide one of the best buying opportunities for preferred stock investors that we have seen since July. November 2010 could very well provide preferred stock buyers with a rare opportunity to add the highest quality preferred stocks to their portfolio at great market prices, courtesy of S&P and some sloppy mortgage paperwork. Invest in the best.